As part of my interest in vibrantly green living, I want to talk about some of the small things that I think can make a difference. I often feel that I don’t know how to make the world a better place on a grand scale, so I stick to my small decisions and hope for the best. While it might not create a huge wave of positive change, I have seen my little ripples touch other islands and get passed on to reach even farther. Sometimes I think about experiments like No Impact Man and read blogs like Zero Waste Home and One Local Family. While I am often tempted to stick to a regimen of eliminating excess and waste from my life, I am so much more drawn to creating. So I work to make fun, useful and enjoyable alternatives to disposable mass production. These days it is easy to find a cool, reusable option for the paper and plastic that so often surrounds us. The trick is to find something that you want to use. Do you forget the crumpled reusable bags that are relegated to the trunk of your car when you go in the grocery store? Start collecting bags that you love to use. Nice colors, slogans that provoke conversation or designs that you want to carry wherever you go, even on the most of mundane chores. Ideally we can all work toward wasting less while enjoying more. Maybe you use a travel mug that holds your coffee perfectly or reminds you of the friend who gave it to you for your birthday. 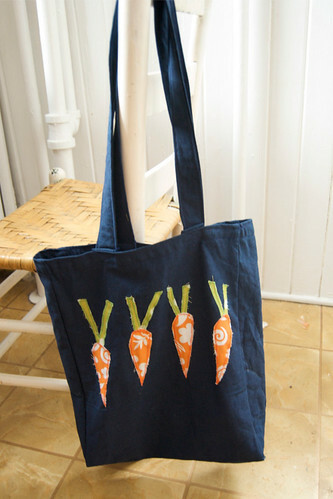 Maybe you cut back on the clutter of plastic bags in a drawer or in the trash by bringing cloth bags to the store. 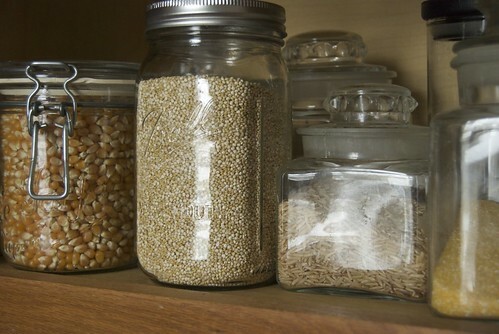 I love the way glass jars look in my cupboard holding popcorn, beans, rice and sunflower seeds. I fill my cloth bags from bulk bins and then store them in these jars. Sometimes these small changes seem so tiny and insignificant, but then I look around. I notice that in so many areas disposable packaging is still the norm. I think about how if everyone made one change to enjoy more and waste less, it would make an impact for good. I have lots more ideas I want to share about small changes that we can all make. I want to hear from you, too. What are some of the changes you have made, or would like to make? How do you waste less and enjoy more? Great question. Some changes I have made include using my dryer less frequently in the winter (I line dry in my basement) and almost never in the summer. We use reusable bags, or refuse bags for items that don't need to be bagged. We compost our compostables. We try to bake and cook a lot from scratch, so we can try to sources our ingredients locally as much as possible (we can get local milk, but not yogurt, so I have been making our yogurt). We just joined a CSA for the summer. We will only eat local, pasture raised meat (but I'm starting to consider vegetarianism again). But WOW, there are way more things on my green to-do list than there are on my done list. One thing I'd really like to do is reduce the plastic bags that we get our bulk items in. Maybe I can sew something that would work? Do you have any pattern or material suggestions? I'm thinking something with a drawstring works well? I'd love to be better about thrifting for items, especially clothes and household goods. Thanks for giving me a chance to think about this and write it all out. Thanks for your comment! I know there is always more we can do, but I think you have a good approach — taking things one at a time, doing as much as you can and gradually adding more. I've been planning a post about your bulk bag question for wednesday!